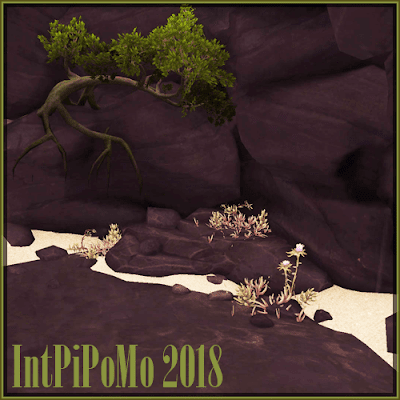 It's that time of the year again: It's International Picture Posting Month! By now, participating in IntPiPoMo has become a cherished tradition for me, as I go through my 10 themed days of SWTOR screenshots and reflect on some things I did and witnessed in the past year but that weren't necessarily worthy of having whole posts dedicated to them. I know these screenshot-heavy posts don't generate much discussion - and I'll admit that they are very easy to make - but I still like the change of pace they offer. Day one, is as usual, about bugs. Interestingly, I didn't find many screenshots of bugs among the pictures I took in the past year. Are Bioware actually getting their act together or was I just lucky to not run into that many? 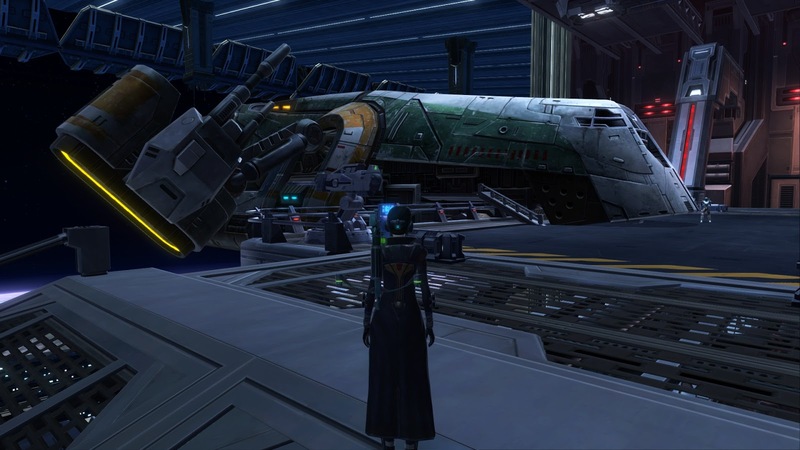 The Jindo Krey encounter in the False Emperor flashpoint has been notoriously buggy for years (ever since they made the side turrets irrelevant I think...) in that the bounty hunter's ship can become invulnerable to attacks when he calls for assistance, which can make the fight quite painful. This was something new to me though, that upon entering the area on my Operative, the ship seemed to virtually have landed inside the space station... it did fly back out when we pulled the boss though. 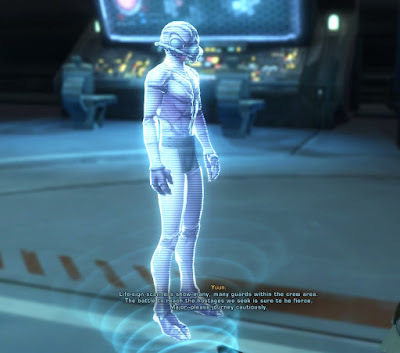 Another "oldie but goodie" is the "companion holocalls you in their underwear" bug. It's kind of incredible to me that it's 2018 and this still hasn't been fixed, but I guess something that does no more harm than cause a couple of silly cut scenes is probably not high on the "must fix" priority list. I could have done without seeing a Gand in underwear though. 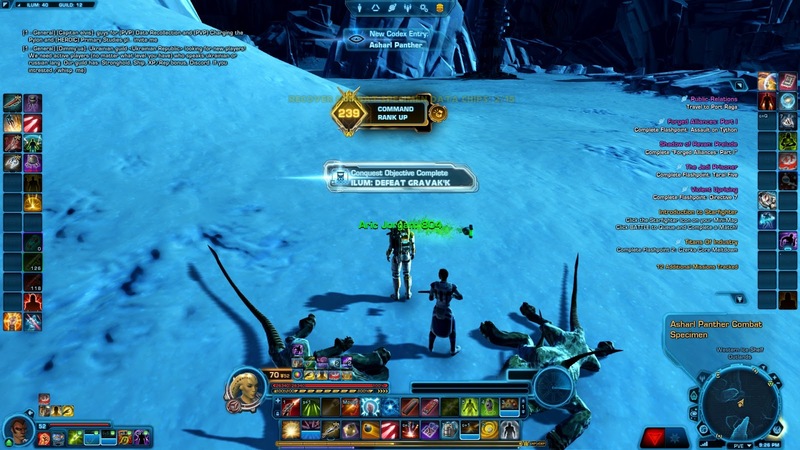 This one requires a bit of context, as to the layperson it may not be apparent what's buggy about me getting an achievement after killing a mob on Ilum. The thing is that the achievement is totally wrong: it credits me for a world boss kill when I just defeated nothing but a couple of random mobs. This happened right after the Conquest revamp, and made the first Gree event in its wake both funny and ridiculously easy to complete, as everyone who killed any mobs at all (it didn't even have to be on Ilum) would instantly get this world boss Conquest achievement completed and gain a whole bunch of points whether they were trying to or not. I thought it was quite amusing, especially watching people's confused reactions throughout the week as each one of them experienced the bug for the first time.